As reported by AppAdvice.com, this is great news for all you iPhone and iPad app lovers out there! The coffee maker is now offering free iOS apps via the official Starbucks app, according to CNET. First launched in 2008, Starbucks’ Pick of the Week program provides customers with digital content freebies. Since 2011, these have included paid content from Apple’s App Store, and iBookstore. Beginning April 9, the app freebies will show up in the inbox of the Starbucks app, or by accessing the Starbucks Digital Network in-store. Since last fall, Starbucks has been offering free music downloads in a similar manner. The first title being offered this way is Rovio’s Angry Birds Star Wars. If you’re interested in other ways to get free apps and other free stuff, check out our post on How to Make Money and Get Free Stuff With Your iPhone. And don’t forget to download the Starbucks app below. After launching the Starbucks app, just tap Messages in the Home tab. Your weekly free download will be waiting for you there. Of note, the free pick-of-the-week cards are still available in-store with different selections than the digital downloads. To see the current paper and digital offerings, click here. 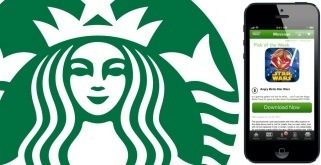 Starbucks is just one of our favorite shopping apps for iPhone and iPad. We’ve collected all of our favorites here. And if you’d like to see more of our top app selections in different categories, just head on over to our Best Apps Series.